In today's fast paced time, many of us rely more and more on medicines to relieve our aches and pains and even ordinary symptoms like cold and cough are treated with over the counter medicines. But have we ever thought of the amount of chemicals we imbibe and the harm they are causing to our bodies? There is a variety of alternate treatments available which are totally natural and do not upset the body's functions. One of them is treatment with essential oils. One can actually turn to these recipes and say goodbye to the unnecessary consumption of medicines. All these recipes contain essential oils, which are very good for the skin and body, and on top of that they have no side effects. Let's take a wise decision today and try these recipes out. We all experience some ache or pain on our shoulder, leg, back, neck and other parts of the body every now and then and taking a pain killer or using some sort of ointment may ease up the pain temporarily but it has its side effects later on. These essential oil recipes are regularly used by many cultures all around the world to alleviate common everyday ailments. They are easily prepared even if you know nothing about aromatherapy and they can be stored conveniently for later use. 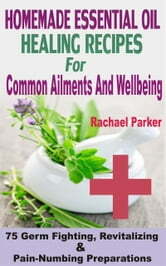 With the close to 60 recipes presented in this collection, you too can begin to enjoy a healthier life and watch your body heal naturally every time an ailment knocks on the door! Atkins Diet Plans: The Quick and Simple Atkins Diet for Beginners With Tips For Atkins Diet for Rapid Weight Loss Based On Low Carb Foods With High Protein Diet Intake! What Makes Me Fat? How to Eliminate Obesity Naturally! Essential Oils: The Aromatherapy Tools For A Quick and Fast Way to Wellness And The Healing Art Today!